Addie’s Note: I love end-of-year wrap-ups. The best of, worst of, funniest of – I can’t get enough of them! In that spirit, we cast the net a bit wider this year. I am included, for instance, despite not having backpacked since pregnant with my son (he’s now five). Maia is included, since she gets out more than I do, and we’re both staff any way! We requested favorite gear and a favorite lifestyle item from everyone, and what filtered in was varied. One Aussie chose to highlight his favorite locations rather than gear. One local (we won’t mention names, but her initials are “Stephanie Jordan”) chose not to write up anything but just list her picks and let your imagination fill in the blanks. We included MAIA, for cryin’ out loud! This isn’t an “Editor’s Choice” or formal endorsement, just a list of stuff we like. Enjoy – and don’t forget to add your own favorites in the forum below! Inov-8 X-Talon 212 Shoes My XT212s (US Men’s Size 9) weigh 8.1 ounces (230 g) a shoe, so they are certifiably “ultralight.” I haven’t pushed them to the limits of performance, but I have worn out a few pairs in the past twelve months. I’ve worn them on talus, scree, slabs, tundra, bush, and snow. They excel on all of these types of terrain. I’ve worn them with heavy and light packs, off and on trail, climbing and descending and sidehilling, and with ultralight crampons and racing snowshoes and gaiters. In other words, they keep my life simple. I no longer make choices about “which shoe to take” – I just grab the XT212s. If Inov-8 succumbs to the business model of the shoe industry, they’ll phase them out or redesign them and ruin them. Until then, I’m stockpiling as many pairs as possible. Don’t wreck them by adding aftermarket insoles and don’t fool around with “easing yourself into” minimalist footwear. Just go cold turkey and do it. There will be tough times, but you may very well break through the wall and never look back. Backpacking Light Absaroka Backpack I’m a bit weary of fooling around with sloppy frameless packs on hard trips where I spend most of my time scrambling off trail, or where I’m carrying heavy loads of food and packrafting gear. A frame that is robust enough to carry forty pounds without collapsing and a harness system comfortable enough to distribute the stress a bit – this is weight well spent. I had a ball co-designing this pack with another hard-core adventurer, and we put the eight prototypes through the ringer before bringing it to market. I love that the pack is durable, supportive, absorbs very little water, and still weighs only two pounds. My production model weighs 28.4 ounces after I trim the excess off of the straps that I don’t need, and add back some Spectra cordage that allows me to lash my ice axe and packrafting paddles to it. Hewlett-Packard 12C I love stuff that lasts a long time and remains useful. I’ve had this calculator for more than 20 years. The only other things that I’ve been with for more than 20 years and still enjoy are my Leica M6 and my wife. I’ve changed the batteries in her (the HP12C) only once, sometime in the late 1990s. It’s been dropped in the toilet (fell out of my shirt pocket when I leaned over to flush it), lost in the snow (it fell out of my backpack during a storm, and I found it a few weeks later after the snow melted), suffered spills of root beer and coffee, and endured several routine rinsings under the faucet to clean it up again. I still use it almost every day and scrub her (the HP12C) clean with a bristle brush and soapy water annually. Beartooth Publishing Maps For hiking in SW Montana and parts of Idaho, Wyoming, and Arizona, you simply won’t find a better map than those by Beartooth Publishing. Up-to-date, use-specific information (like local breweries!) in a convenient size and scale, all printed on waterproof, tear-resistant plastic. Arborwear Tech Pant These pants are light, but not ultralight. Why then have I made them my apparel choice of 2010, you ask? Because they exhibit a quality of extreme-uber-crazy-durability. I first purchased these pants in 2006 and have worn a single pair of them almost exclusively since (I kid you not). Whether you’re looking for a pant to hike in, work at the (laid-back) office in, play in the snow in, raft down a river in, bicycle in, or do just about any activity you can imagine in – not only will this pant hold up to the necessary abuse, it will do so in comfort and will dry quickly afterward. Constructed of an ultra-rugged nylon, these pants wear with the comfort of cotton, but have all the characteristics of nylon that I require as an outdoorsman. HTC Droid Incredible It’s a phone, camera, and GPS all in one. Put the device into “airplane mode” while you’re out of cell range to save battery life, and the GPS still functions for recording your hike and geotagging your photos. Gossamer Gear “The One” One-Person Single-Wall Tent Gossamer Gear’s “The One” tent deserves a Backpacking Light Gold Award, if we had one. It has been around for a while and is time-tested; I have tested a lot of very nice tents, but this one really stands out. It weighs less than many tarps when you add in the weight of stakes, guylines, and groundsheet, yet it provides full weather and bug protection for one person plus gear, has a vestibule protected side entry, and good headroom. Optional sectional poles are available for hikers who don’t use trekking poles. Kooka Bay Sleeping Pads I loved the Therm-a-Rest Prolite 3 and the Backpacking Light TorsoLite pads when they came out because they were so lightweight. But over time, like the closed-cell pads I used before them, I found them simply not comfortable enough for a good night’s sleep. Then came the Big Agnes Clearview pad, which is comfortable, but punctures too easily. Next came the Therm-a-Rest NeoAir, which is a wonderful pad. But the Kooka Bay pads blow them all away for light weight, comfort, adequate durability, and value. My favorites are the torso length pad (19/13.5 x 33 x 1.5 inches/5.6 ounces/$60) and mummy pad (60 x 20 x 2.5 inches/10.2 ounces/$80). Look for a Backpacking Light State of the Market Report in spring 2011 on Lightweight Inflatable Sleeping Pads. Trail Designs Caldera Keg Cooking System The Trail Designs Caldera Cone has transformed the alcohol stove into a cooking system as convenient and reliable (but not as fast) as a canister stove. And there are several advantages that make it better: no expensive disposable fuel canisters, inexpensive fuel, an enclosing windscreen for better thermal efficiency, and extreme light weight. My very favorite is the Caldera Keg system. The complete system for one person includes a caldera cone, Heineken or Foster’s cook pot and lid, alcohol burner, fuel bottle, cup/carrying case with lid, cozy, and stuff sack. It’s a complete cooking system at a weight that’s equivalent to a lightweight titanium cook pot. Walking is not just about gear; it is also about places. 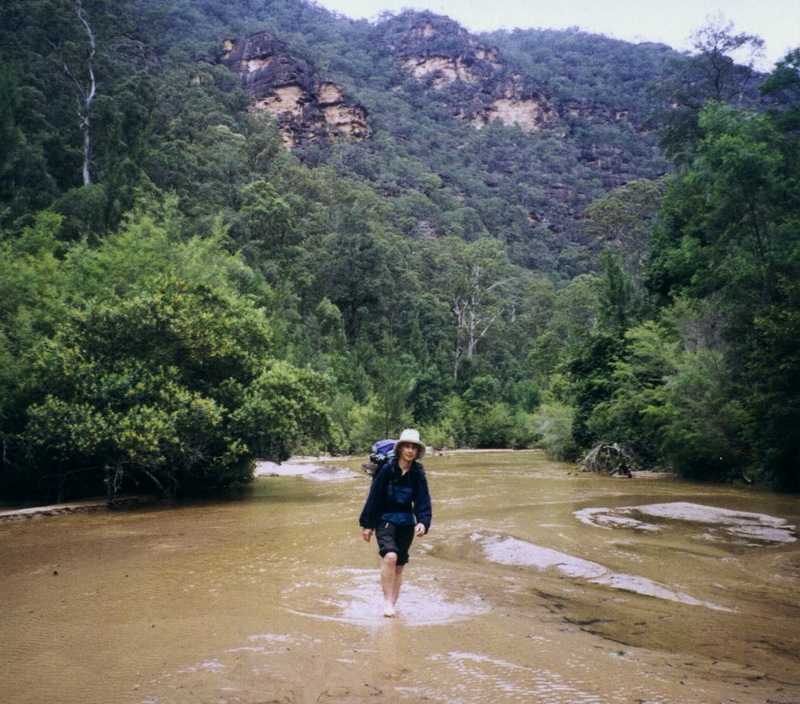 So this year I decided I would feature some of my favourite places in Australia to go walking. Each hyperlink will open a new tab with a full-size pic. 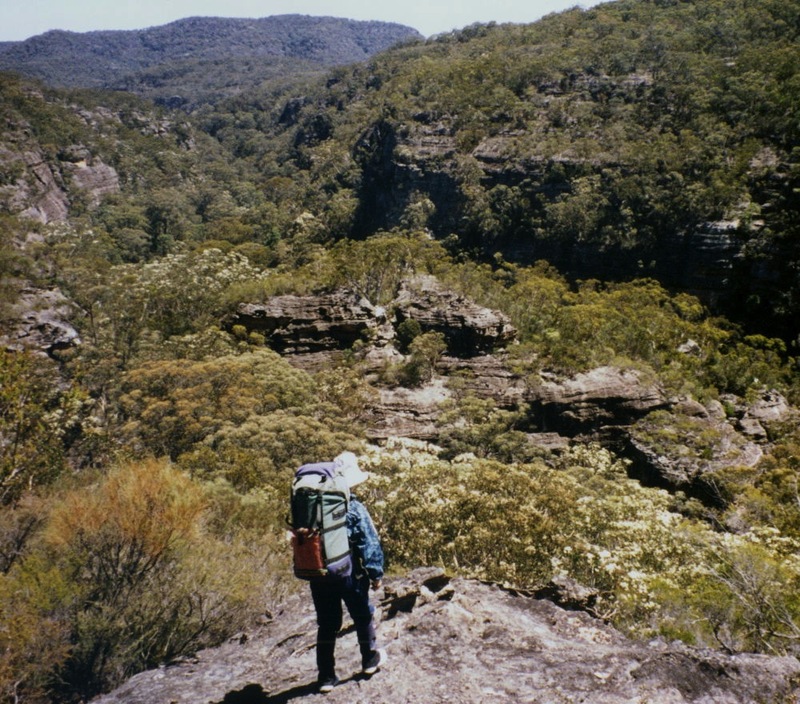 Wollemi National Park This is one of Australia’s largest National Parks, and it is very close to our biggest city Sydney. And yet, the vast overwhelming majority of Australians know it as little more than a place on a map. Very few actually go into it. The whole area was once a river delta where sand was deposited and turned into hard sandstone – up to 600 metres (1,969 ft) of it. Then it was slowly uplifted, but the rivers kept flowing to the east and cutting through the rock – yet the fault lines which developed ran north-south. 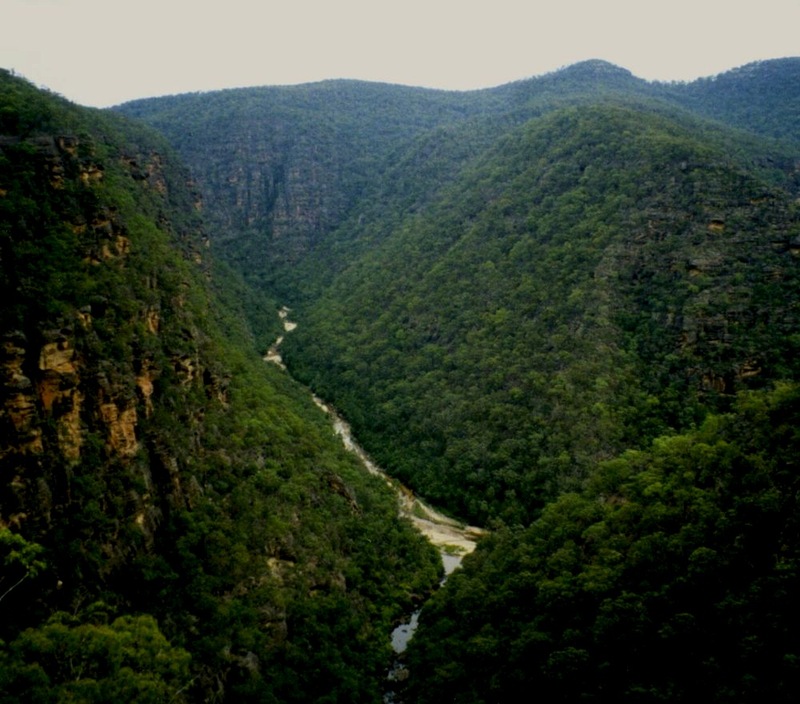 The result is a rather flat plateau deeply incised by a tangle of gorges with massive sandstone walls. The scrub on top is dry and harsh; the jungle in the valleys is – well, jungle. Navigation can be extremely difficult, as there are few outstanding features and a little distance visibility. The area remained unclaimed by settlers in the early days of colonisation because it was just too wild and inhospitable, for which we are truly grateful: we love it. 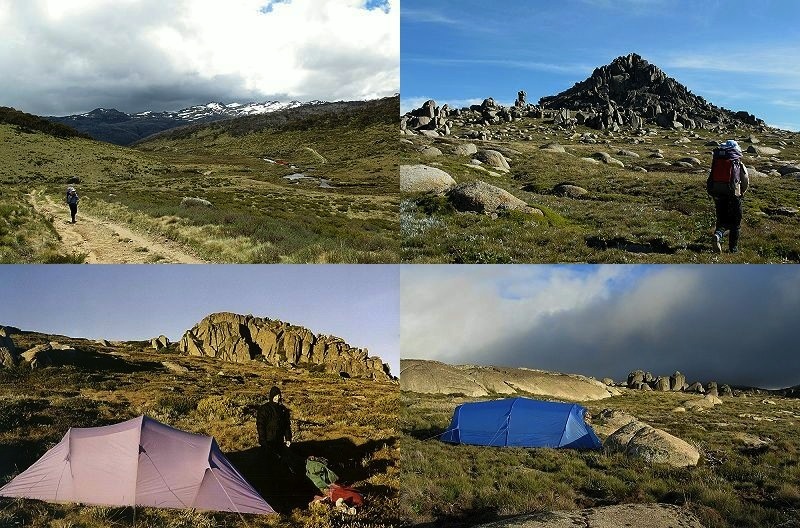 Kosciusko National Park in Summer This is another one of our huge National Parks, with lots of high country. 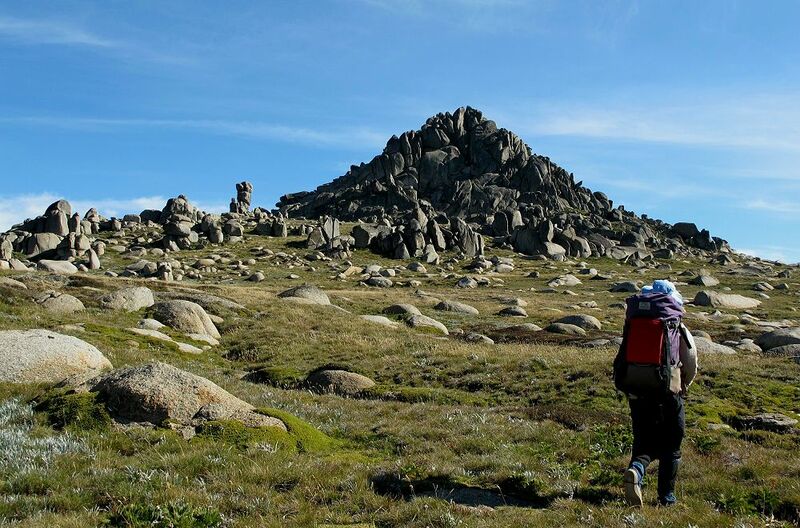 It was once leased out for grazing, but the leases were all cancelled many years ago when it became clear that the graziers (well, their sheep and cattle) were destroying the high country. Some of the locals are still a bit upset about their loss, but the rest of us rejoice. I am sure the area was once a range of high mountains, but Australia is an old, old tectonic plate, worn down almost to a granite nubbin. We value what we have left, but sometimes wish for slightly higher peaks. Instead we have a rolling country, wonderful for walking and XC skiing. 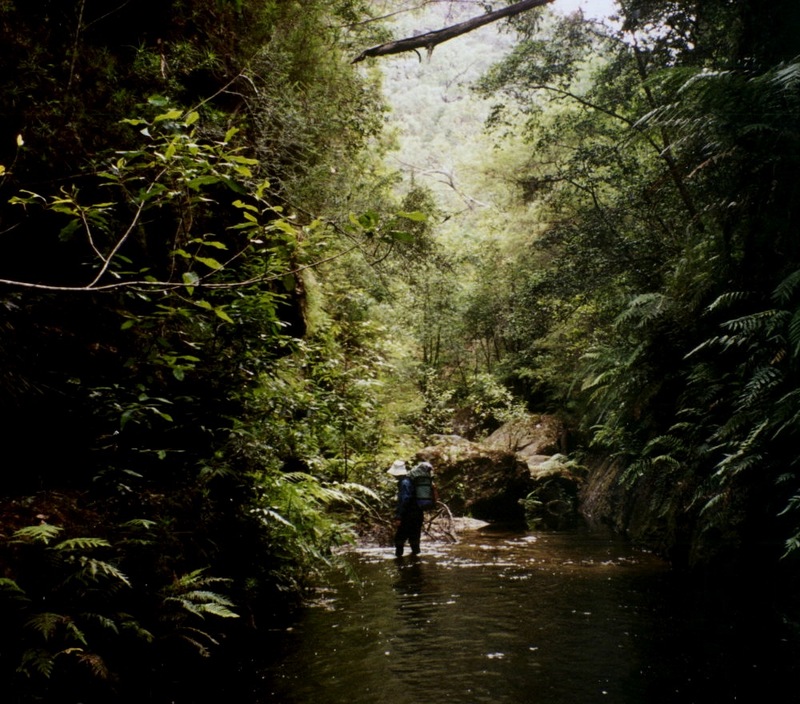 Ah – just don’t go down the sides into the sub-alpine scrub: you may not return. 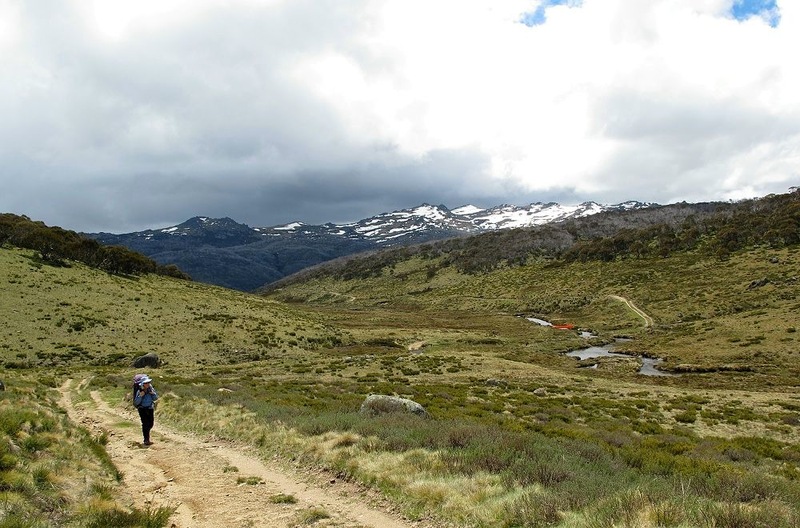 The first photo shows Boggy Plain at the head of the Thredbo river. The valleys are grass while the ridges are tree-clad. Ever heard of frost-hollows? We have got them, and they make wonderful open walking. In the background we have residual snow on the Ramsheads, near Mt. Kosciusko (our highest mountain at 2,220 m / 7,218 ft) itself. The track is left over from grazing days. The next photo shows one of the Ramsheads – yes, that pile of granite boulders is all that is left. The way the granite boulders pile up is sometimes fascinating – some of Slartibartfast’s creations maybe. Further to the east in photo three, we have the Rolling Grounds with the Granite Peaks, and our old Olympus tent pitched in front of some of the residual granite. It might have been early autumn, but overnight it was definitely sub-zero, and my wife was grateful for her down duvet in the morning. Our gear has gotten lighter since then. 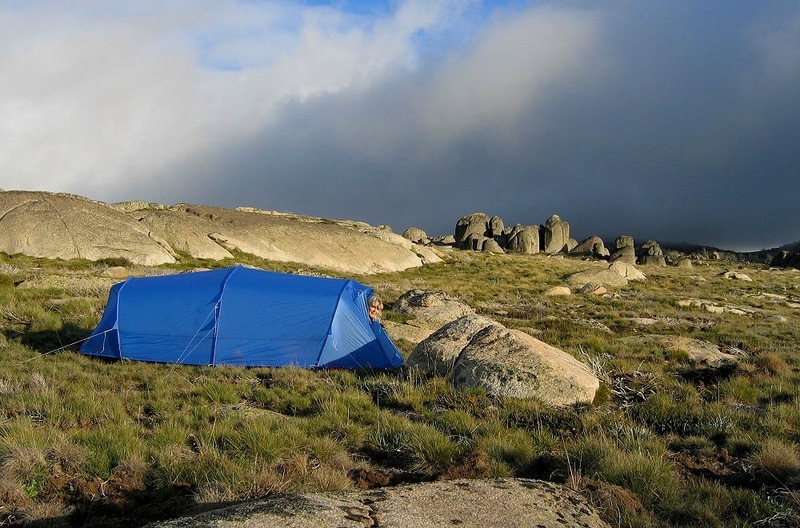 The last photo is of my lightweight summer tent, pitched near a multiple creek junction known as Four Ways. The sky was a bit threatening that evening, but we survived the night – even if it did snow a bit. Taking a summer tent into that country is always a bit of a gamble. Kosciusko National Park in Winter Well, the snow may not be wonderful, and it is getting worse each year, but what’s there is all we have. At least there is a huge expanse of it. 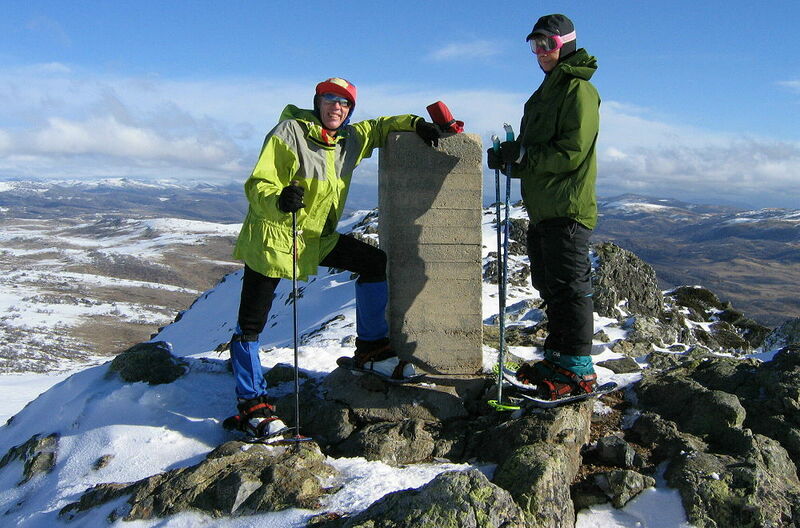 Sometimes we go cross-country ski-touring with packs, for up to a week at a time. The rolling country makes that lovely, although the weather does not always cooperate. 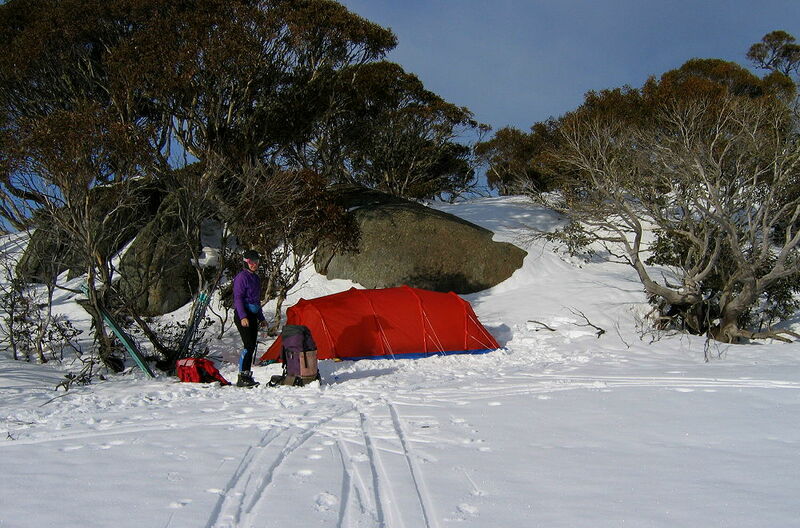 Other times we get out our rather light Australian Yowie snow shoes. The snow shoes can handle the really grotty snow when the rocks show through… And yes, we wear joggers with our snow shoes. The first photo shows the summit of Mt. Jagungal, way to the north of Mt. Kosciusko. In fact, Kosci, as we call it, can be seen very small on the horizon at the left side. This photo was taken rather late in the season when the snow was melting. 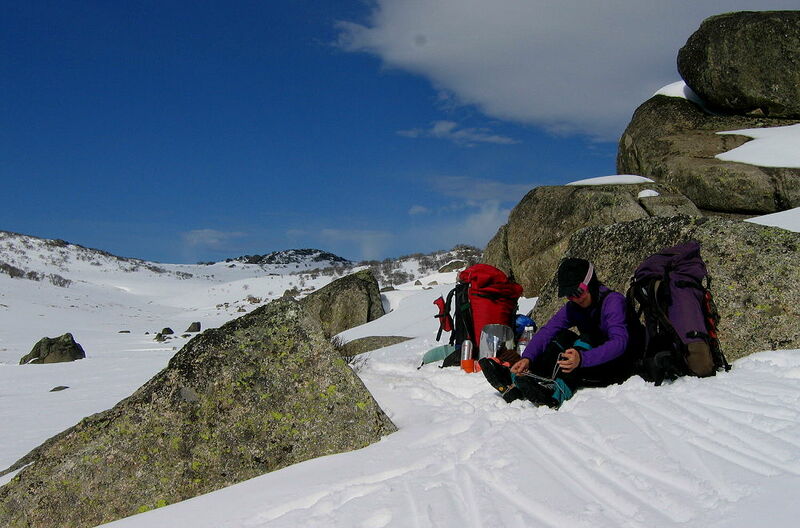 The next photo shows a morning tea spot near Four Ways, tucked in behind some boulders to get out of the wind. Yes, we do get a lot of wind up there. A lot of ‘weather,’ actually. My wife is adjusting her old three-pin leather XC ski boots. In the next photo, the orange tent is one I made myself, a lighter version as it were of the Olympus tent shown before. That tent has taken some extreme weather at times up in the snows, but here the evening was fine. Once again we are using snow gums as a wind break. 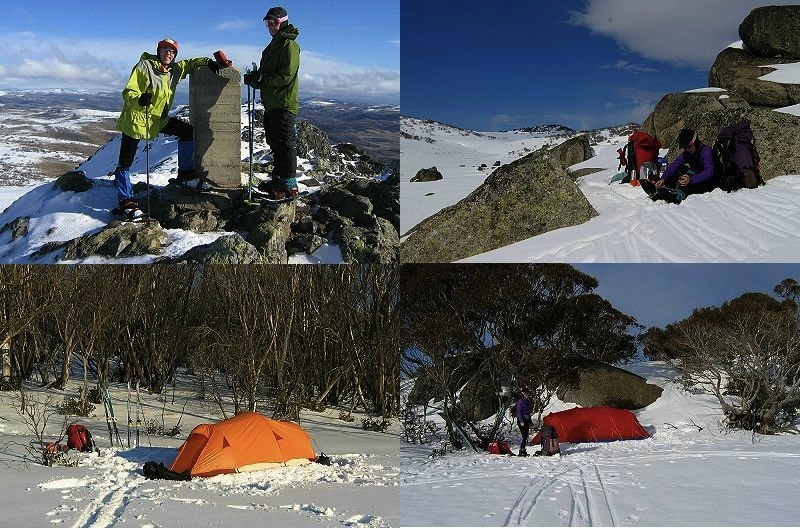 In the final photo, the red tent is my latest winter tent, lighter than the orange one, and pitched up high on a ridge with some snow gums and boulders to act as a wind break. 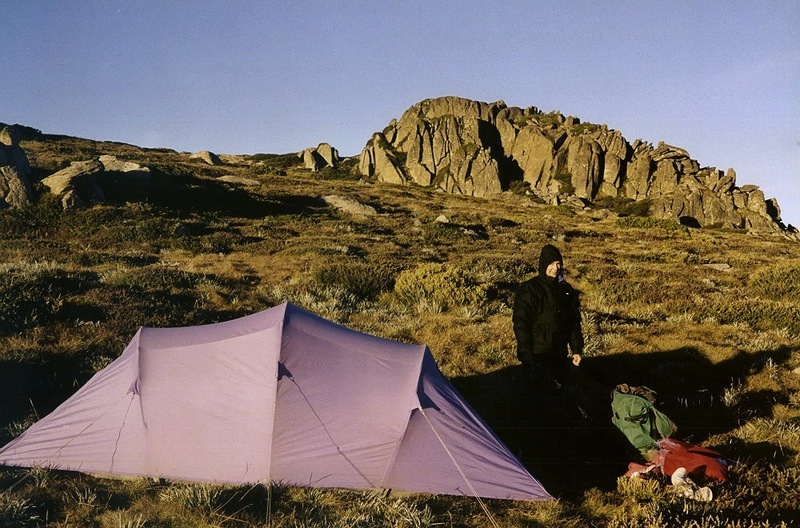 We camped early that day and went exploring out to Tarn Bluff for a while. In this photo we have switched to NNN-BC bindings: lighter and the skis turn better. ULA Ohm Backpack The Ohm has been my only pack for year-round use in the southeast U.S. for the last couple of years. Sure, I’ve flirted with other packs (What guy doesn’t? Just don’t tell my Ohm. ), but ultimately come back to the Ohm every time. My first hands-on experience came as a result of pack fitting for my girlfriend, Robin. When I weighed the Ohm and found it to only be an ounce or so heavier than my Conduit, I ordered myself one. An ounce is a small penalty to pay for the frame and subsequent better carry. The weight listed includes a foam back pad, two hip pockets, and an interior pocket. Backpacking Light Stealth Nano Tarp When I found out about the Nano, I knew I had to have one. I was previously using an MLD Grace Duo, an excellent tarp for two, but the Nano is a great green color, and a good bit lighter. The Nano also required no seam sealing, thanks to the bonded ridge. I used the Nano on every trip where I slept solo, as well as on the WTS trips where I shared it. For one person, the coverage is superb. For two people, when pitched to the ground for a storm, it’s a bit tight but still usable. The weight listed includes the stuff sack, all guylines, and the MYOG addition of two hang loops placed along the ridge. Yoga I started doing yoga in 2009 as part of an exercise program and fell in love. I’ve tried to keep up with practicing once or twice a week since. There are times when I dread doing yoga, but I always feel great when I finish and am glad I pushed on. I’ve seen my flexibility increase dramatically, and I fully believe yoga contributes to keeping my body injury free. It has provided a great meditational benefit, as well as a way to let go of stress. The best parts are the weight and cost. MSRP: knowledge costs nothing (it’s the learning that will nick you)! Páramo Quito Jacket Hiking in temperatures around freezing is always challenging. Precipitation comes as rain, sleet, freezing rain, and/or wet snow that melts on your clothing. And, here in north Idaho we seem “blessed” with more than our fair share of this kind of weather. If you wear a soft shell in these conditions, water will eventually penetrate your clothing defenses and you’ll end up cold and wet. If you wear a hard shell at more than a snail’s pace, your own sweat will eventually build up inside the shell and you’ll end up cold and wet. If you wear a poncho or use an umbrella, the wind will… well, you get the idea. Páramo’s Analogy clothing takes a different approach to keeping you dry and warm. The system combines a thin, DWR-treated outer windshell with a hydrophobic, directional microfleece liner. The outer shell protects against wind and reduces the amount of water that reaches the liner. The liner relies on capillary depression to resist further water penetration, while a void gradient actively pushes any water that does penetrate back to the outer surface of the liner. The system is not technically waterproof as it cannot withstand much hydrostatic pressure, but the combination of the liner and shell is water-resistant enough to handle the cold, wet, windy conditions common in the UK where Páramo is headquartered. As the shell/liner combination has much higher air permeability (up to 2.5 CFM) than a conventional wp/b shell, the system is far more breathable than ordinary waterproof jackets. At first glance, the 18-ounce weight seems overly heavy. But the Quito Jacket is fully-featured with numerous pockets and venting options, as well as an excellent hood. Due to its liner, the jacket can replace both a mid-layer and hard shell in cold, wet conditions. It has become my favorite clothing piece for just about any conditions below 40F where it stays on my back rather than in my pack. Nalgene 16 oz HDPE Loop-Top Bottle What, 2.5 ounces (71 g) for a tiny water bottle? Yes, yes, the hard-sided canteen is one of the first items to be replaced when a hiker sees the lightweight light. But things are a bit different in the winter, when the caps on small-mouth bladders can freeze shut or when you try to pour melted snow from your pot into a floppy bladder with a tiny opening. For snow camping, I like to carry two small, hard, wide-mouth bottles because of the wonderful things you can do with them when they are filled with hot water: They can be safely brought into your sleeping bag for warmth where a leaking bladder would be catastrophic. They are the perfect size to stuff into your wet socks or boots to help dry them overnight. While you’re eating breakfast, you can put them in your boots and experience the unbelievable luxury of putting on warm boots on a sub-freezing winter morning! Stephenson Warmlite 2CR Tent I’ve spent many a winter night in various shaped tarps and snow shelters, but at the end of a long day skiing or snowshoeing, when the temperature is falling and the wind is rising, it’s very hard to beat a fully-enclosed four-season tent. Warmlite tents have had a cult following for decades. They rely on extremely high tie-out and fabric tension to achieve their shape with a minimum amount of pole, stake, and material weight. The shape itself is designed to provide very high wind resistance, especially with such lightweight construction. The new “C” version of their tents are shortened two feet from the standard versions. This results in some weight savings, but more importantly reduces the amount of unsupported fabric between the two hoop poles, increasing the tent’s ability to handle snow loading. The total package creates a two-person, four-season tent that is lighter than just about any alternative of similar space and weather protection. The Warmlite 2CR tent does have its idiosyncrasies, though: It lacks a vestibule. Achieving the required high stake tension can be difficult at some sites. Pitching it properly and quickly requires a bit of skill and practice. Finally, managing condensation can be a bit tricky in calm conditions. Still, when you consider that most mountaineering tents with the same amount of usable interior space are two or three pounds heavier, learning the techniques to master its quirks is well worthwhile. Montbell Dynamo Wind Pant The “wind pant” title is much too limiting for this lower layer. From early June through late September I wore this pant as my never-removed base layer. I comfortably walked on 85 F (29 C) sunny days and 30 F (-1 C) wet days. I walked in ’em, slept in ’em, scrambled in ’em, swam in ’em, and sat on ’em. At less than 3 ounces I was impressed that they would last a whole summer of disrespectful use and abuse in southwest Montana with NO tears! Expect to see them again next summer tromping around in the mountains. DriDucks Scrap Rain Skirt So far no one has caught a photo of me wearing this paragon of backcountry style. Paired with the wind pant above, this combo is my total solution to every combination three seasons of weather can dish out. After a few trips by the students in my adventure program, a pair of DriDucks pants is ready for a skirt transformation. A few snips and a bit of Tyvek tape later, you got an easy on, easy off, waterproof and very breathable/breezy rain layer. Spark-Lite and Tinder-Quik These are my constant companions in every backpack I own. Whether a backcountry ski, hike, or search and rescue operation, I count on the one-handed Spark-Lite and a Tinder-Quik to start my cooking, warming, navel gazing, and socializing fires. Sealed in one or two tiny Ziplocs, depending on your Ziploc trust level, they are bone dry and ready to warm up the night. Alan Dixon – Washington, D.C.
SPOT2 Personal Locator I took couple of high risks trips in remote locations this year – alpine climbing in the Andes (Cordillera Huayhuash) and a packrafting trip in Alaska. It was reassuring to know that I could summon help with the SPOT2. My family and friends were saved angst knowing I was OK each day as they tracked my Andean summits and progress along Alaskan rivers. But possibly the best feature of the SPOT2 was vicariously participating in my friend’s trips to exotic places like the Himalayas and the Pyrenees, etc. via a shared SPOT tracking page. Note: The SPOT2 is about half the size and weight of the original SPOT1. It is much easier to operate and delivers far greater message reliability. 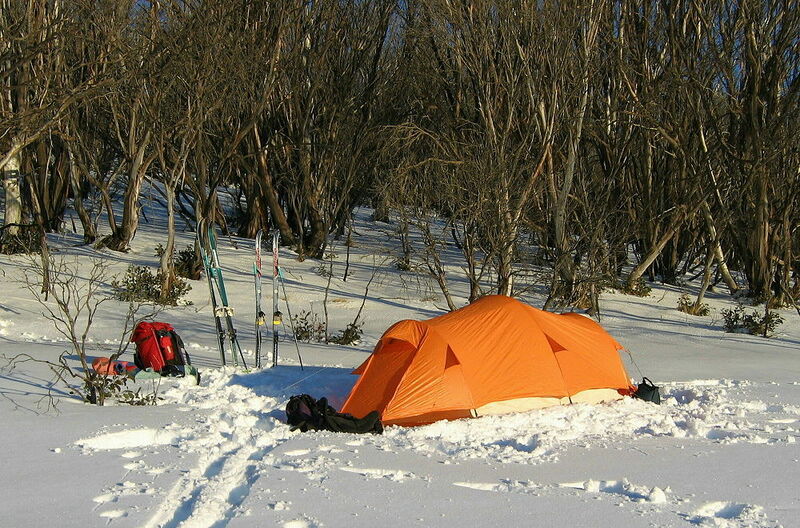 Mountain Laurel Designs SuperMid 2010 I usually sleep out in a bivy or under a tarp, but the MLD SuperMid was near heaven in the cold and wet Alaskan climate. I remember cheerfully cooking dinner inside the SuperMid while the wind shrieked across the tundra and rain pelted the walls. The tent is silly light for two people given its palatial interior space. It easily held all our gear with additional room to spread out, cook and eat dinner. In the morning we cooked, ate breakfast, dressed and packed up inside the tent – the entire time blissfully dry, warm, and sheltered from the wind. The last thing we did was step outside and pack up the tent body. Vortex Viper 8×32 Binoculars More and more of my trips focus on pursuits besides backpacking and climbing. Photography tops the list, but birding and nature observation are catching up. There are many 8- to 12-ounce (227- to 340-g) compact binoculars on the market – Nikon ProStaff 8×25 are my pick – but these lack field of view and suffer in dawn and dusk, some of the best times to view wildlife. Thus, for the best views of birds and wildlife I prefer a mid-size 8×32 binocular. They have the best balance between optical quality and weight. The Vortex Viper 8x32s with ED glass and exotic lens coatings are close in optical quality to the very best $2,000, 8×32 binoculars from Leitz, Zeiss, and Swarovski. But the Vortex Vipers cost a just little over $300! (I don’t know about others but I am reluctant to take a pair of $2,000 binoculars on a backpacking trip. Things happen.) The Vipers are waterproof, fog proof, and rubber armored. At less than 20 ounces, they are within an ounce of the very lightest of high-end 8x32s on the market. EXOTAC nanoSTRIKER I have been carrying a fire starter of some sort attached to my safety whistle for as long as I have been hiking and backpacking. While they have gotten smaller and lighter over the years, it is hard to get excited about a stick that makes sparks. Then I found the EXOTAC nanoSTRIKER. This is the prettiest, most well designed fire striker I have ever seen. It is even 50% lighter weight than the Light My Fire Scout I had been using for the past seven years. It is made of 303 stainless steel and 6061 aircraft aluminum, with a 440C steel “striker” to spark the ferrocerium rod. The nanoSTRIKER packs down to a miniscule 3.4 in (86 mm) in length. Trail Designs Caldera Ti-Tri Fissure Last year saw me finally go to alcohol stoves, which I continued this year in a big way. I loved my first Caldera Ti-Tri but did not care for how much room it took up in my pack with its protective caddy. This led to the Caldera ULC Ti-Tri which I liked, but it was not as efficient as the regular cones. After discussing my thoughts and findings with the guys at Trail Designs, they let me buy the second ever Fissure, a two-piece titanium Caldera cone that completely fits (along with the 12-10 stove) inside of my Snow Peak Mini Solo pot. It instantly became my favorite solo cooking system, and I even shared it a few times. As I always carry the two Ti tent stakes needed for set-up anyways, the Fissure is perfect for me. While I just use it with the alcohol stove, it works with an Esbit GramCracker or can be configured for wood-burning mode also. Javan Dempsey/The Stateless Society 40 F (4 C) Quilt Over the past two years I have switched every sleeping bag I own rated above 0 F (-18 C) to quilts as I have found that they fit my toss-and-turn, side-sleeping style much better, and I love the reduction in weight and volume in my pack. While I own three beautiful quilts from Nunatak Gear, this year I had one of our BPL members (Javan Dempsey of The Stateless Society, the.stateless.society@gmail.com) make me a custom summer quilt based on a design that he and fellow member Greg Mihalik worked up. Made of Intrepid 0.9 nylon and filled with 7 ounces (198 g) of 900+ down, it has no straps or drawstrings, but is wide enough to tuck around and under me if needed. While I had been shooting for a 40 F (4 C) rating, this quilt served me well down to 33 F (1 C) in just my boxer-briefs and a shirt, which was not too surprising as it lofts up to 2 inches (5 cm) between the 1.5-inch (4-cm) baffles I specified. I ended up taking this sweet quilt backpacking more than any other quilt or bag in 2010. MSRP: depends on size, features, etc. FlyWeight Designs FlytePacker Packraft I’ve been fascinated by packrafting for some time now, but didn’t dive in because of the cost. Further, I wanted a packraft for alpine lakes more than river running, and the extra toughness isn’t necessary for this lighter use. Enter the FlytePacker packraft. At barely over 2 pounds (< 1 kg) and at a reasonable $269, this is a packraft that I could justify in both cost and weight. I’ve only begun to play with this raft but it was the centerpiece of a multi-day trip with my 4-year-old son Henry this summer. It was an absolute pleasure to paddle around the lake, do some Tenkara fishing, explore some hard to reach talus fields, and to experience our favorite lake in an entirely new way. Then at night he slept soundly on it, making my Neo Air seem like solid rock in comparison. I can’t wait for further adventures with a FlytePacker! Grand Shelters Icebox Igloo Building Tool I’ve had this tool for several years now and am quickly approaching my tenth igloo. I can’t think of a piece of gear that has added more fun to my trips – or to the kids in my neighborhood! At almost 5 pounds (2.2 kg) and with a building time (for me) of 3-4 hours, a case could easily be made for using a winter tent instead. However, the warmth, strength, and joy of sleeping in an igloo adds SO much to winter trips. Getting to camp and building an igloo has become a key part of the enjoyment of winter camping and the added warmth means I don’t have to worry about extra insulation or the weather outside – it’s always well above freezing inside. The Icebox tool makes building a perfect igloo an easy process, and unlike snow caves, you don’t need much snow; I’ve built igloos with neighborhood kids with as little as 4 inches of snow on the ground! Once built, I’ve only been able to destroy one by cutting it apart with a snow saw. I love igloos, my kids love igloos, and the Ice Box tool is a marvel of engineering that makes igloo-building a fun and successful process. Apple iPhone 4 32G I had an iPhone 3 and would often leave it at home on backpacking trips. The iPhone 4 goes with me every time now. It has a 5 megapixel camera and shoots clean HD video for recording my adventures (with easy Facebook posting on the way home). The built-in GPS works great for geocaching and with the Topo Maps app, I can have all the GPS-enabled USGS topos I want for just $7.99. In camp I can listen to a few songs if I feel the need and there is an LED flashlight as a backup. The compass works well, the Clinometer app is very accurate, and I have a Wind Meter that is surprisingly accurate as well. At night, I use Star Walk to learn new constellations and identify planets – it’s amazing. Battery life is an issue, but on a recent three-day trip I returned home with 93% battery remaining despite never shutting it down (add a solar charger and you might be good indefinitely). The secret to saving power is turning off the wifi, bluetooth, and using Airplane Mode (which still allows GPS to work). Increasingly, I leave my GPS, camera, and mp3 player at home in favor of this do-it-all wonder device. When there’s service, it even makes phone calls! Hennessy Hammock Hyperlite A-Sym Zip At just over a pound and a half, this hammock is easy for me to justify as a solo shelter. The new zipper option makes entry/egress a snap, and converting to camp seating just requires a zip and flip. It’s comfortable, light, and a joy to use. Put simply, this hammock compelled me to be a part-time hanger when others have not. Available now. Integral Designs eVent Pullover Just the facts, ma’am: 10 ounces (283 g), sturdy three-ply eVent, good fit, and a hood. I’ve worn it comfortably when other shells would have sweated me out. Although it’s simple, it’s executed just right. (Note: This is essentially the Rab Demand Pull-on and is not ID’s current eVent Pullover Jacket.) Available spring 2011. La Sportiva Wildcat I bought two pair of these shoes and am considering a third. Great trail shoes are a pleasure to find. The Wildcats give me excellent stability, without impeding my natural gait, in a surprisingly light package. The fit works really well for me, and for a wide range of people as I’ve found in retail. The Wildcats seem to find their way onto my feet quite often. Kahtoola Microspikes Winter is a wonderful time to hike in the Grand Canyon; the burning heat of summer is gone and so are the crowds. Last winter, I hiked from the South Rim of the Grand Canyon down the Hermit Trail, along the Tonto Trail and back to the rim along the Bright Angel Trail. Although the Tonto Trail was mostly snow free, the descent down Hermit was steep, rocky and sometimes ice-covered. Kahtoola Microspikes over my trail runners kept me upright and striding confidently throughout the descent. They provided great traction in steep ice and were undamaged by rocks. Outsak UL Continuing with the Grand Canyon theme, the critters along the Canyon corridor trails are very persistent and innovative when it comes to “hunting and gathering” food from unsuspecting hikers. I’ve had to drive off a skunk with pebbles and stare down overly bold ravens that still looked hungry – after they ransacked my pack. The lightweight steel mesh in the Outsak UL provides an ounce-counting solution to food protection from small critters. The Outsak UL I’ve listed has room for about four days of low volume food. It is also available in a smaller size. iPod Nano, 5th generation I love backpacking and reading, and I especially love combining the two. I’ve carried an iPod Shuffle loaded with an audio book on each trip for the last several years. The Shuffle is very light, but it is easy to bump the wrong button and lose your place in a book and there is no quick way to get back to your spot. This year I decided to upgrade and was excited by the look of the new iPod Nano. However, it turns out the touch fast forward is not well suited for the fine control needed to find a particular place in an audio book. What works perfectly is the click wheel found on other iPods, including older versions of the Nano. Refurbished 5th generation Nanos are available on the Apple website and elsewhere. Tigi Rockstar Dirty Secret Dry Shampoo, assorted hats and felt flowers My favorite hat weighs 3.2 ounces (91 g) when paired with a felt flower on the end of my braid. Anything that keeps me from having to wash my greasy head daily is a winner in my book. The citrusy-smelling dry shampoo keeps me from an awkward “why’s that girl trying to do dreddies?” look, and the hat and flowers cover over (or distract from) a multitude of personal hygiene sins. Also, I am endlessly lazy and these goodies keep me in bed a few precious minutes longer, at least until a certain cute kindergartener pops in demanding breakfast. Neosporin Lip Health Daily Hydration Therapy I am not really a lipstick girl. Shoot, I live in Montana, where lip balm counts as make-up. I go through a lot of balm in the dry climate up here, but it can be hit or miss. Some make the chapping worse, despite repeated application throughout the day! The Neosporin stuff is MAGIC. After about a week, I needed lip balm less often. It’s a weird product that exists to help you use less of it, but I’m wholly sold. It has 20 SPF so that my kisser stays looking youthful and wrinkle free… and without flavor/glitter/gloss, I can even slap it on my husband or son without remorse. Sorel 1964 Pac Boots By now it’s probably clear: I am not much of a backpacker (much less a lightweight one!) at this stage in my life. I am okay with this. So okay with it that I own a pair of boots that weigh 26 ounces EACH. They are pretty much amazing and almost all I wear the entire winter in the frozen chosen of Bozeman. I have paired them with a skirt and tights: VERY cosmopolitan. They keep my feet warm and keep me vertical on the ice that is so prevalent around here. +10 points for Pacs! And my honorable mention that paid for itself within the first two months of owning it: my espresso machine, lovingly treated with LavAzza Italian espresso. So….what Do the Tech Pants weigh? Ah yes, Addie. We spent more on Super Crema beans than ANY backpacking gear! the GPS is disabled when in airplane mode. It is a complaint made by many, myself included. We want a wilderness-mode setting for the Iphone that turns off cellular network seeking, turns off wifi seeking, and enables gps reception. Apple ignores us, if enough complain perhaps we'll get it. Email sjobs@apple.com with a request for a wilderness-mode setting — or a "enable GPS only" or something that will accomplish this. Correct Roleigh. Sorry about that. I turn off the cell service but don't do Airplane mode. Thanks for the correction. Great list this year guys. I love how the Staff Picks has evolved over the years from just strictly backpacking gear to including the places that we love to go, gadgets we like to bring and to just things that work for us whether they are ultra light or not. That is the greatness of this site and its people. You can also get this calculator for your iPhone/iPod Touch, for $15, or 12C knockoffs for less. My 11C is still going strong. And lots of daily use. My wife learned RPN, and now neither of us can run an algebraic calculator. When you can find them, they ain't cheap. It will be a sad, sad, day when the inevitable happens. I have one 12C, but I prefer the 32S, of which I have two. And my daughters have RPN HP calculators too. Hopefully, the 32S will outlast me. Someone boobooed the photo. I'm sure it will be fixed. That would be me. Thanks for the correction! I had the original HP 45. Cried like a baby when it died. Then I went to the HP 11C. Cried like a baby when it died. Now have the HP 32S. The #1 button sticks occasionally. I'm tired of crying – I'm going to replace it tomorrow. My pants (that I am OF COURSE wearing right now because I wear them EVERY DAY) weigh about 25 ounces. Oh, and any top-picks list that mentions Slartibartfast is nerdy enough to be a winner in my book. non of this RPN stuff. I have to ask though… Ryan, does your 12C go out into the back country, and if so, what are you using it for? My HP 41 CV is still goiing strong after 27 years of engineering. I've had to change my batteries more than Ryan has. I too have had my 41CV for about as long with no issues at all. I was told about a website by a fellow 41CV user that had his repaired after it stopped working. The site is fixthatcalc dot com. It looks like they will repair just about any HP calculator ever made. The kind of stuff you reach for when you fall"
Ryan – I purchased my HP-15C in January 1981 and it's still humming. Pocket sized, powerful, programable, ultralight calculator nirvana. I don't remember the last time I replaced the batteries. What a tool! In the mean time I've worn out three HP printers and moved on to another brand. What ever happened to that "old" Hewlett-Packard quality? Sam – If you're looking to replace your nearly indestructable Arborwear Tech pants with some other "stuff that works" you might take look at Rail Riders Versa Tac Light pants. At 15 oz. (medium) their not especially light weight, but they are incredibly tough and the side access zips on the cargo pockets are pretty darn handy when you're sitting down.